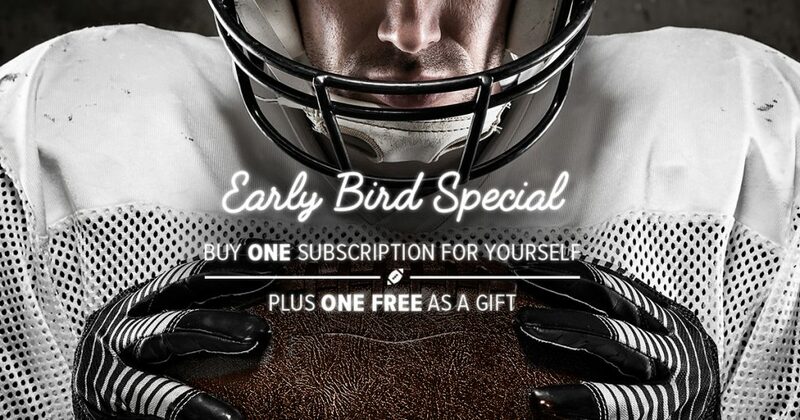 The Buy One Get One Free Subscription Special is back! For just $31, you can get a full year PDF/Email subscription (23 issues) for yourself — and FREE BONUS subscription for a friend. Or spend $23 for a 17 week Email Subscription that will push a PDF version of our newsletter to your inbox during college football season. We are now in the thick of the 2017 season, gaining some clarity about which college football teams are contenders and which ones simply hope to salvage what’s left. The preseason was full of talk about potential, but we never really know how teams will perform and respond to pressure until practice turns into full-contact games. The season, so far, has produced some stunning upsets and surprise upstarts. We are at the stage where teams are hoping the successes or losses of their recent opponents reflect well on the College Football Playoff selection committee. This is also a critical time when injuries will begin to slow the momentum of teams. Vanderbilt started out 3-0 and was riding high after beating Kansas State 14-7 in Week 3. The Commodores, however, hit a brick wall called the Alabama Crimson Tide in Week 4 and found themselves 3-2 after losing to Florida. Enthusiasm also rose in Starkville after Mississippi State beat LSU 37-7. This was tempered by a 31-3 loss to Georgia and a 49-10 pounding by Auburn, as well as the realization that LSU would lose to Troy in week 5. Speaking of Auburn, they got off to a slow start in 2017 with an anemic offense that failed to live up to preseason hype, losing to the defending national champion Clemson Tigers and barely beating Mercer before turning things around with impressive wins over Missouri, Mississippi State and Ole Miss. Then they blew a 20 point lead in Baton Rouge and fell 11 spots in the latest AP Poll, breaking the hearts of fans who were beginning to think the Tigers might actually be in the College Football Playoff discussion after all. Ohio State’s fortunes fell after the Buckeyes couldn’t complete passes over 10 yards against Oklahoma on their home turf, but came back with wins over Army, UNLV and Rutgers. They fell from a No. 3 ranking to No. 12 this week. The Sooners fell from their No. 3 ranking after losing a Week Six shocker to Iowa State, which was a 31-point underdog. The Florida Gators lost their opener against Michigan, then struggled to beat Tennessee and Kentucky — then came Saturday’s 17-16 loss to struggling LSU. An ugly 41-0 loss by the Volunteers to Georgia was enough to make Butch Jones’ seat much warmer. The Bulldogs, in contrast, look like the team to beat in the SEC East. Speaking of Butch Jones, he looks like a “dead man walking” as he faces Nick Saban. Alabama is off to an unsurprising undefeated start that included that 59-0 humbling of Vanderbilt and a 66-3 win over Ole Miss. So far, the Tide has done nothing to prove itself unworthy of the top spot in the polls. Aside from Bama and Georgia, the rest of the Southeastern Conference is uncharacteristically weak so far this season. Kevin Sumlin and Texas A&M have had mixed success. Arkansas was 2-2 headed into the loss at South Carolina. On Sept. 2nd, the Gamecocks handed NC State their sole loss so far, which seems odd considering the Wolfpack has wins over better teams like Florida State and Louisville. Perhaps no team in the country has disappointed this season like Florida State, which was expected to give Alabama more of a challenge in the season opener and also had that 27-21 loss to NC State. Initially ranked No. 4 in the preseason, the Seminoles aren’t even in the Kickoff’s Top 25 rankings anymore. Things have not gone so well for Nebraska, Missouri or Stanford, earning them mention on the chilly end of the Kickoff Thermostat — our newsletter feature highlighting weekly good or bad superlatives. On the flip side, Washington State’s 30-27 upset of USC had fans talking playoffs before they lost this past weekend. At the start of the season, USC was ranked No. 2 in The Kickoff Preseason Top 25. At UCF, Scott Frost has done a phenomenal job of turning the program around. Clemson has shown capable of winning without Deshaun Watson — at least until facing Syracuse. Other teams on the rise so far this year include TCU, Michigan, Miami (FL), and Utah. However, the Wolverines lost 14-10 at home to Michigan State. The Hurricanes managed a last-minute win to end the losing streak to Florida State. And how about Penn State?! To get the special Buy One Get One Free Special on 2017 electronic versions (PDF) of The Kickoff newsletter, delivered weekly on Monday mornings to email inboxes (as advertised on WDEF Channel 12), click the link. Additionally, you can subscribe by visiting this link to print, fill out, and mail the form to us with your enclosed check or credit card number. A third option is to call our office at (423) 267-0953. Our patience is nearly rewarded as we get ready for the start of another exciting season of college football action. Kickoff Editor Tommy Duff offered a few thoughts while preparing Issue One of the college football newsletter, arriving August 28th. The new and improved newsletter is adding two additional pages to the PDF version this year, available for a limited time as a Buy One Get One Free Subscription Special online. The early lead to the College Football Playoff starts on September 2nd at Mercedes Benz Stadium. That game will be one of our Games of the Week, along with Florida vs Michigan and West Virginia at Virginia Tech. Duff expects much from Southern Cal as they build upon a 9-game win streak and a victory in a Rose Bowl Classic. “Though their schedule isn’t easy, they play all their toughest matchups at home,” he said. Penn State’s success last season surprised many. “Nobody saw them making it to the Rose Bowl Game, but now the faithful expect them to build upon that success, and the pieces are in place for them to do just that. Their most challenging games are in late October, though having Michigan and Ohio State in consecutive weeks is never ideal,” he said. • Can Ed Orgeron continue to right the ship at LSU with QB Danny Etling and RB Marion Guice as his main weapons? • Will Baylor transfer Jarrett Stidham finally give Auburn a proven efficient passer with a cannon under center who can make Gus Malzahn’s offense finally produce again? • Can we expect some significant improvement in Mark Richt’s 2nd year at the helm in Miami? • Will Richt’s old team, Georgia, be able to capitalize on a wealth of returning talent and avoid the last second meltdowns? • How will the suspension of 7 players, including star WR Antonio Callaway, affect the Florida Gators in their opener against Michigan? • Will defending Heisman Trophy winner Lamar Jackson — the most electrifying college football player in the country last year – make Louisville one of the hottest teams in the country again after 3 losses to end the year left a sour taste? • Will Michigan be able to replace the talent lost from their 10 win squad of last year before facing off against Penn State on October 21? • Has Stanford’s rising junior Keller Chryst fully recovered from the ACL injury from last season’s Sun Bowl? • Can Boise State prevail in week two, when they travel to Washington State, and enjoy one of those type years they perfected during the BCS era? • What will Charlie Strong be able to do with a South Florida team with one of the country’s most manageable schedules and led by one of the best quarterbacks in the country in Quinton Flowers? • What will be the impact of all of the turmoil on Ole Miss? • Where will teams like Tennessee, Oregon, Texas A&M, and Arkansas end up after teams in the Top 25 start to fall? The long wait for a new season officially ends at 1:30 pm Eastern on Saturday, August 26th as Oregon State and Colorado State clash at Sonny Lubick Field. Stanford, Rice, Hawaii, UMass, South Florida, San Jose State, Portland State and BYU also have games that day before the majority of FBS teams play on Thursday, August 31-Saturday, September 2nd. Just don’t wait because the season is almost underway! A month into the 2016 college football season, the College Football Playoff picture is not quite locked, although it’s clear which teams are most unlikely to play in it. Some picked LSU pre-season to win the National Championship, yet the Tigers are 2-2 and without Head Coach Les Miles after losing 18-13 to Auburn, despite scoring as time expired just before the snap. Tommy Duff, Editor of The Kickoff, said he wasn’t shocked to see Miles get fired considering the pre-season expectations. There’s still a long way to go in the season, but this could be a very long season for Notre Dame, where they lost to Duke 38-35 for a 1-3 start to the year. “Stoops at Kentucky is also in trouble. Will Muschamp at South Carolina has some time to develop that program but the talent level have severely dropped in Columbia,” Duff said. Another pre-season favorite, Georgia, has also struggled against North Carolina and Missouri before falling this past weekend to Ole Miss. “Firing Coach Mark Richt made a lot of sense last season when the favorites to win the SEC East lost to Alabama, Florida and Tennessee, but a program had better have a plan in place to keep things up if it makes a decision like that,” Duff said. He thinks new Head Coach Kirby Smart is not exactly on the hot seat, although some Georgia fans may lose patience if the Bulldogs can’t beat a resurgent Tennessee that’s fresh off breaking an 11-year losing streak to the Florida Gators. Alabama still sits atop the Kickoff Top 25 Poll as well as others. “They’re certainly beatable, but you have to beat them on speed,” he said. The Tide faces off against Kentucky after beating Kent State 48-0. The Kickoff has Ohio State at #2, ahead of Louisville and Clemson. The Louisville-Clemson game on Saturday will force some separation between the two. The Kickoff’s other Games of the Week are Stanford at Washington, Wisconsin at Michigan, and Texas at Oklahoma State. Find out more about these and other content in this week’s issue, which includes the Kickoff Thermostat, Conference and team standings through week 5, and The Kickoff’s Power Ratings to compare the match-ups.